Calafia Armada at an event in Mosswood Park. You may not know this but, back in the early 2000s, La Estrellita in East Oakland used to be the premier spot where some of the best cumbia bands used to play — Los Angeles’ La Candelaria even played there. And, of course, the Bay Area’s best, Tokeson, La Misa Negra, and La Colectiva were all part of the cumbia culture inside La Estrellita. As music venues opened in downtown Oakland, though, most shows moved to spots like The New Parish, and less parties took place at La Estrellita (which remains a delicious place to get authentic Mexican food). But cumbia parties are coming back to La Estrellita, and, in a sense, these are a way to fight gentrification and reclaim the glory of those Latin parties from back in the day. 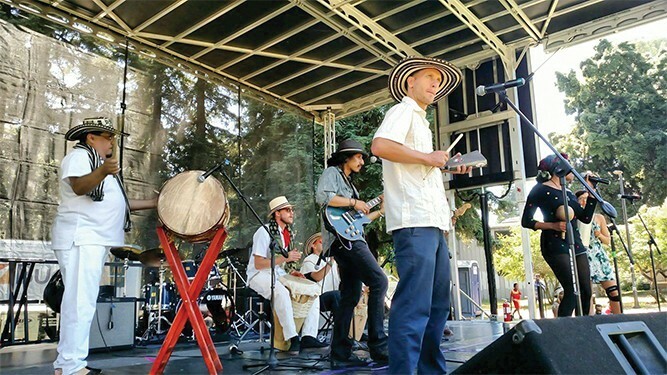 Saturday’s show is Lado Oriente’s CD release. The group consists of former members of La Colectiva and Tokeson. Calafia Armada will be opening the show, and DJ Tlacoyo from San Jose will be behind the turntables. It’s time for the cumbia OGs to come out and dance and bring along someone who has yet to experience a cumbia show. Saturday, June 17, 9pm, $10, 21+, 446 East 12th Street, Oakland.